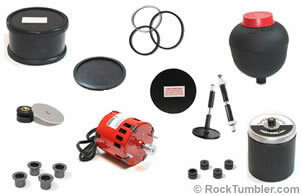 Rock tumblers, instructions, supplies, everything you need for rock tumbling! Thumler's MP-1 Kit: Our best-selling tumbler because it is inexpensive and quiet. The soft rubber barrel makes much less noise, than a toy tumbler with a plastic barrel. 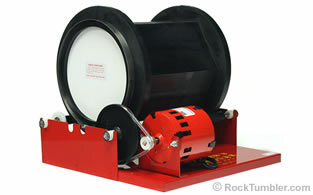 Try rock tumbling with a quality machine at a low price. 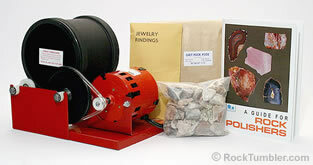 Includes everything you need to produce one batch of tumbled stones. Includes a small jewelry kit. Perfect for the beginner. Convenient refill kits are avaliable here. Thumler's A-R1 Kit: Larger and more durable than the MP-1 shown above. The barrel will quietly tumble about twice as much rock. Has an overload-protected motor on a metal frame. Will last for years. 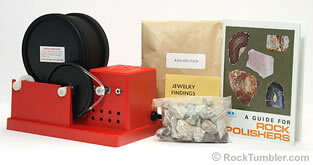 Includes rocks, grit, small jewelry kit and instructions. Convenient refill kits are avaliable here. Thumler's A-R2: Similar to the A-R1 above but with two 3-pound capacity barrels. You can tumble two different materials at one time, materials at two different steps in the tumbling process, or two people can each have their own barrel. Thumler's A-R12: A large tumbler with a 12-pound capacity barrel. Used to quietly tumble a lot of rocks or to clean brass ammunition casings. With minor adjustments can be converted to run two 3-pound barrels. Thumler's Model B: The largest tumbler that we sell. Has a 15-pound capacity barrel and a larger motor than the tumblers above (overload protected). Used to tumble rocks but is very popular for cleaning brass casings. Has a thick rubber liner to prevent leaks and run quietly. 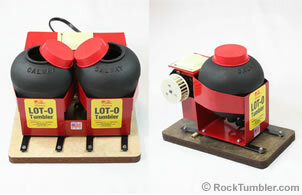 Lot-O-Tumblers Tumble a batch of stones in just 7 to 14 days! 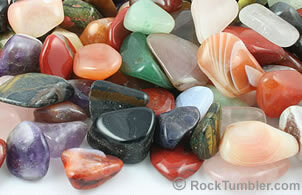 The Lot-O uses very little grit and produces an awesome polish on agate, jasper and many other rocks. Save time, save electicity, use less grit, and save money with a Lot-O-Tumbler. Thumler's UV-18 Vibratory Tumbler Thumler's Ultra-Vibe industrial tumblers are heavy duty tumblers designed for rock tumbling. We offer one with a four-pound bowl, a ten-pound bowl and an eighteen-pound bowl. All three are designed to tumble rocks. 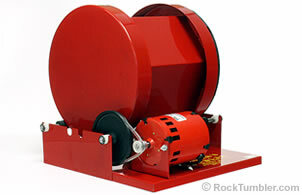 Rock Tumbler Parts: We offer parts for Thumler's Tumblers, Lortone and Lot-O-Tumblers. For other brands and vintage tumblers please read this article. All of the grit you need for rock tumbling. Single use kits or by the pound. Save by purchasing a bulk grit kit. Rock polish and pre-polish in convenient resealable containers. Two sizes of ceramic cylinder media and plastic pellets. These are used for cushioning, delivering grit and as filler. 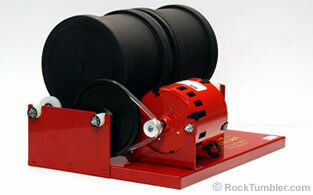 We offer refill kits for two and three pound barrels. Each refill kit comes with the amount of rough, grit and polish needed to run through one tumbling cycle. Best Selling Tumbler Rough Tumbling enthusiasts know when they see a great deal. This 20 pound bag has a great variety of 1/2 to 2 1/2 inch material and costs less than $4 a pound. Tumbled Stones: We offer one of the internet's largest selections of beautifully-polished tumbled stones from around the world. We highly recommend: Modern Rock Tumbling by Steve Hart. Learning is the fastest way to improve the quality of rocks that you tumble. In this book you will learn from an expert with extensive experience. You will increase your abilities, learn to save time, and have a great reference book that you will use again and again. We reach for this book frequently. We sell jewelry parts that you can use to make nice key chains, pendant necklaces, tie tacks and bracelets with your tumbled stones. Picture identification guide for polished stones and tumbled rocks. 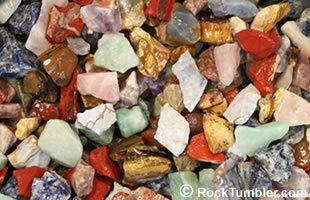 Includes most of the stones in our mixtures. How Long Does Tumbling Take? 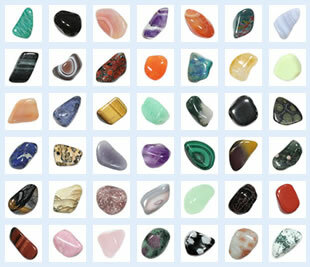 We highly recommend: Gemstone Tumbling, Cutting, Drilling & Cabochon Making by Jim Magnuson, Val Carver, and Carol Wood. This is our favorite book for a person who does rock tumbling and now wants to make beads, pendants, and jewelry from tumbled stones. Information about drilling, face-polishing and cab cutting.